Lateral collateral ligament (LCL) is a thin set of tissues present on the outer side of the knee, connecting the thighbone (femur) to the fibula (side bone of lower leg). It provides stability as well as limits the sidewise rotation of the knee. Tear or injury of LCL may cause instability of the knee that can be either reconstructed or repaired to regain the strength and movement of the knee. 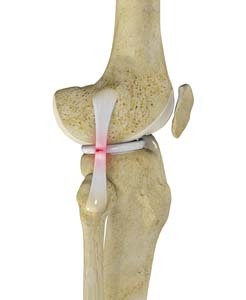 The LCL is a part of the posterolateral corner (PLC) – not to be confused with the PCL or posterior cruciate ligament. The LCL and a few other smaller ligaments/tendons stabilize the outside and back of the knee. The knee is the largest joint of the body and is stabilized by a set of ligaments. In the knee there are four primary ligaments: anterior cruciate ligament (ACL), posterior cruciate ligament (PCL), medial collateral ligament (MCL) and lateral collateral ligament (LCL). The treatment of the torn LCL include non-surgical interventions such as rest, ice, elevation, bracing and physical therapy to help reduce swelling, and regain activity as well as strength and flexibility of the knee. Surgery is recommended for high-grade injuries to the LCL. Surgical interventions include repair and reconstruction of the torn ligament. Based on the severity and location of the injury, repair or reconstruction of the LCL is recommended. In case the ligament is torn from the upper or lower ends of attachment, then repair of the LCL is done with sutures or staples. If the ligament is torn in the middle or if the injury is older than 3 weeks, LCL reconstruction is recommended. LCL reconstruction involves replacement of the torn ligament with healthy strong tissue or graft. The tissue or graft can be taken either from the tissue bank (called allograft) or from the patient’s body (called autograft). The type of graft used, depends upon the condition of the patient and choice of Dr. Patel. Hamstring tendons are commonly used as autograft, as removal of such tendons does not affect the strength of the legs and effectively stabilizes the knee. A small incision is made on the lateral side of the knee to perform the LCL reconstruction. The procedure is done through an open incision and not arthroscopically. The thighbone and fibula bones are drilled precisely and accurately with specialized instruments to form tunnels. The ends of the tendon graft are passed through tunnels and are fixed by using screws, metal staples or large sutures. The knee undergone LCL reconstruction surgery is braced for 6-8 weeks.